In the spring of 2013, then-Director of the FBI, Robert Mueller III, testified before the U.S. Congress he was not aware the Muslim Brotherhood’s Islamic Society of Boston (ISB) – attended by Boston Marathon bombers (Tsarnaevs) – was founded by Al Qaeda financier Abdurahman Alamoudi. Abdurahman Alamoudi is a Muslim Brother, a Hamas operative, and a financier for Al Qaeda. He pled guilty in the Eastern District of Virginia in 2004 after being arrested in 2003 in London with $340,000 cash, and was implicated in a plot with UK-based Al Qaeda operatives to kill Saudi Crown Prince Abdullah. Alamoudi now sits in federal prison. 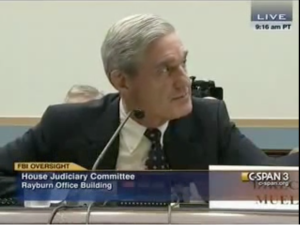 In fact, during his Congressional testimony, Mr. Mueller made it a point to let Congressman Gohmert (TX) know the FBI was inside the Muslim Brotherhood’s ISB prior to the bombing doing “outreach” with the Imam. Good plan. Let’s see, since 9/11, U.S. government outreach to Muslim Brotherhood organizations has produced ZERO results. This also means Director Mueller was not aware a founding trustee of ISB is Yousef Qaradawi, the Muslim Brotherhood’s most prominent legal scholar/jurist, nor was he aware the Muslim Brotherhood’s Muslim American Society (MAS) is directly linked to the ISB, and working to undermine communities all around Boston. Maybe we should not be shocked. Afterall, this is the same Robert Mueller who brought Hamas (dba CAIR) into FBI headquarters for “outreach” to get their “point of view” on how to interact with the Muslim community. Hopefully, Mr. Mueller’s level of fact-finding is significantly more professional today than it was while he was FBI Director. The myth of religious moral equivalency continues to skew our leaders’ judgment. Like lambs to the Sharia slaughter? The true extent of the Madness of Muller is evident from his doggedly unjustifiable pursuit of President Trump – who by any standard – more especially of the Huma Abedin Saga – is positively angelic. And the elephant in the room? OBAMA. He has systematically seeded America, and in particular the White House, with fifth columnists which it could take a generation of cleansing to eradicate. Some vermin take many years to eliminate, especially when they have been given the wherewithal to infest vast areas. But there is no doubt in my mind that President Trump and his team are onto the whole festering Islamist Programme – what he needs to do is to rid himself and his Presidency of ANY residual influences of the Obama INFILTRAITORS who deeply infest the body of US politics. Hopefully this new President will be a continuating resident. Outstanding post Paul. I’ve said many times that Obama did irreversible damage to this country, of course he had plenty of help, his “Useful Idiots” and the Marxist Sycophants in the so-called news media. Furthermore, in view of section 3 of the 14th Amendment to the Constitution, and In keeping with the lyrical holiday tenor of Isaac Asimov’s “Super Quiz” on page E7 in the paper today, it also appears that the safest place for a coterie of treasonous* 9/11 fugitives-from-justice to hide is either under an ill advised (or possibly coerced) federal mandate to “investigate” others, or in at least one glaring example, “Deep In The Heart Of Texas at “Home On The Range”. *See Article 3, section 3 of the Constitution [I.e. Treason] which applies to “levying War” against the United States on behalf of its enemies. To secure a verbatim Arabic-to-English translation of the global Islamic movement’s 22 May 1991 comprehensive declaration of war on the country, which was seized from a subterranean basement in Annandale, Virginia in 2004 by Special Agents of the FBI in compliance with a federal search warrant, and in abeyance to their oaths to protect and defend the country from all enemies both foreign & domestic, contact http://www.securefreedom.org and request (for a nominal handling & postage fee) a copy of: GOVERNMENT EXHIBIT 003-0085 3:04-CR-240-G, U.S. v. HLF, ET AL. Thanks very much Donald for the information, I will post it as well on other sites, just as I do understanding the threat. On some sites like yahoo it must be done without tying the words together or it wont get posted, that happened to me. I think We The People perhaps have known or suspected more than Mueller. If one follows the jargon, killings, recruitment modes, Shariah Law’s insults to America over the years…I mean…it’s wholly obvious. I know Mueller is a busy guy…but to be so naïve on this subject is shocking. He’s either lying or is really ‘unaware’. But I’m a cynic.